After upgrading to the latest and greatest version of our statistical software, Minitab 17, some users have contacted tech support to ask "Wait a minute, where is that Two-Way ANOVA option in Minitab 17?" The answer is that it’s not there. That’s right! The 2-Way ANOVA option that was available in Minitab 16 and prior versions was removed from Minitab 17. Why would this feature be removed from the new version? Shouldn’t the new version have more features instead of less? 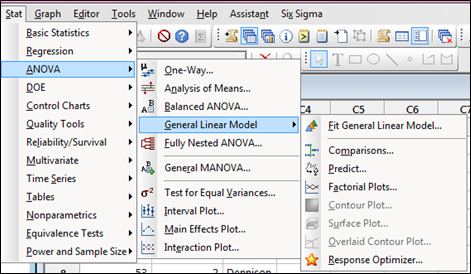 Two-Way ANOVA was removed from Minitab 17 because you can get the same output by using the General Linear Model option in the ANOVA menu. 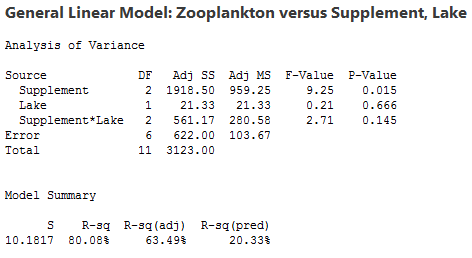 Removing the separate 2 way ANOVA menu choice reduces redundancy and creates a more similar workflow for the linear models options. Let's look at an example that shows how to replicate the Two-Way ANOVA output from Minitab 16 using Minitab 17. 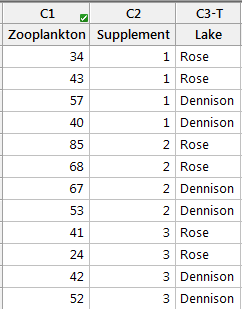 The data shown below is a sample dataset used for 2-Way ANOVA in Minitab 16: You as a biologist are studying how zooplankton live in two lakes. You set up twelve tanks in your laboratory, six each with water from one of the two lakes. You add one of three nutrient supplements to each tank and after 30 days you count the zooplankton in a unit volume of water. You use two-way ANOVA to test whether there is significant evidence of interactions and main effects. 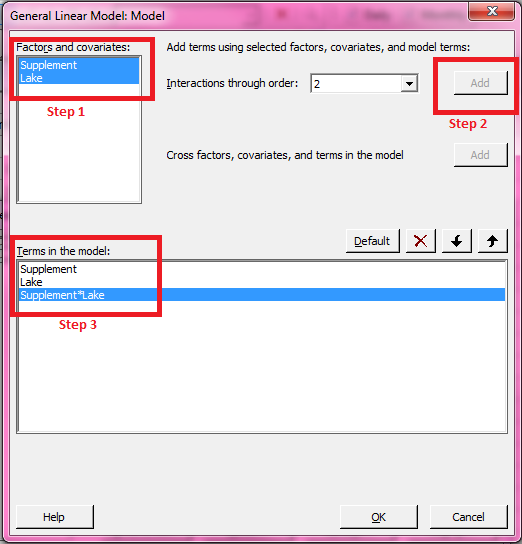 Minitab 16's Two-Way ANOVA option also shows the two-factor interaction, so in Minitab 17 we need to manually add the interaction by clicking the Model button in the GLM dialog box. There we can highlight the factors listed on the left side (step 1 below); when we do that, the Add button on the right will become available. To add the interaction, click Add (step 2) and the interaction will be shown at the bottom under Terms in the model (step 3). 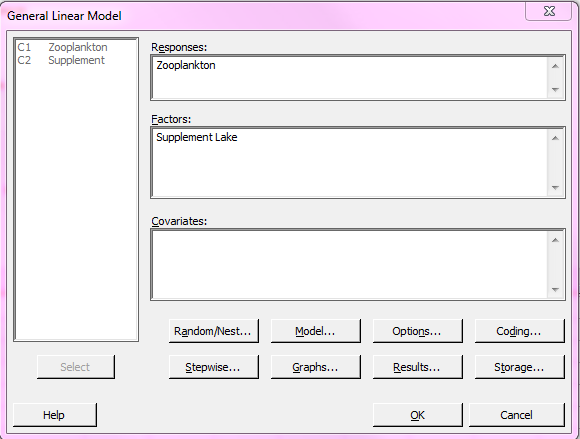 Click OK in the Model dialog box to return to the main GLM dialog. By default, Minitab 17 will provide more detailed output than Two-Way ANOVA in Minitab 16. To make the results match, we can remove the additional output by clicking the Results button within the GLM dialog box. 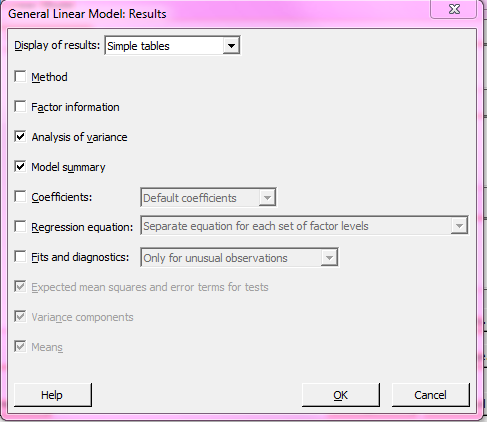 Unchecking the additional options so that only Analysis of variance and Model summary are selected (as shown below) will make the output match Minitab 16’s Two-Way ANOVA results. If you're wondering how to do something with Minitab, our technical support team is always ready to help you. Our technical support representatives are knowledgeable in statistics, quality improvement, and computer systems. Best of all, our assistance is free.